This seems crazy. In the stern of a Mark V Zodiac on the Arctic Sea I’m slipping into a dry suit, fitting into flippers, and adjusting a snorkel mask. Then Terry, the guide, instructs to jump overboard and turn on my belly, feet facing him. Once so positioned, he slips a lasso around my ankles, fires up the 60 hp Mercury engine, and pays out the line. “Don’t forget to sing,” Terry yells. “What kind of music?” I garble. So as I’m being dragged, backwards, through the cold water, I begin my playbook…Francis Scott Key, Tom Waits, Paul Robeson, Leonard Cohen, Barry White…but nothing happens. Then I remember Terry saying that women, with their higher voices, seem to get the best results, and so I switch to The Four Seasons and Michael Jackson, and boom….suddenly the space in front of my mask is filled with belugas, dancing, squeaking, chirping, and grinning at me. They bend and curve like ballerinas. There must be twenty that swim up, turn heads in a seeming greeting, and then dart away, like phantoms into the night. This is wild. This is wonderful. I’m being trolled for whales. Who came up with this wacky idea? In 2012 Nassir Ghaemi wrote a book, A First-Rate Madness, in which he suggests that Abraham Lincoln, Franklin D. Roosevelt, Ted Turner, Martin Luther King, Jr., and other potent personalities who shattered old thinking, were all a little crazy. In the travel sphere there are many, starting perhaps with Thomas Cook, who in 1855 brought a tour group from England to the Continent for the first time, paving the way to cross-sections of society to experience what had been the province of the privileged. He’s mad, said the gentry. In the 1960s Lars-Eric Lindblad pioneered tourism to Easter Island, the Galapagos, and the Falklands. “He’s nuts,” said the mainstream. Not long after Leo LeBon introduced trekking in the Himalayas, and I admit to being called crazy many times over when I started offering raft trips down the wild rivers of the world in the 1970s. Mike Reimer may fit this mold, three-times over. He is, after all, the improbable visionary who concocted this seemingly insane way to commune with belugas. And he designed a way to walk, eye-level, with polar bears, and his outfit remains the only in the world to offer such. And he came up with the idea of crafting luxury lodges in extreme latitudes to give access to these beasts of the northern wild. Edgar Allan Poe, assessing himself, said: “Men have called me mad; but the question is not yet settled, whether madness is or is not the loftiest intelligence.” Mike Reimer just may possess the loftiest intelligence. I press against the window of a de Havilland turbo Beaver to a badlands of nothingness and nobody. There are tiny lakes, spots of water that look like human eyes brooding. Then over the bay I look down to white whales scattered like spilled rice on a kitchen counter. This is a place far apart, desolate as the mare of the moon. There are no roads, bridges, homes, people or pollution. How could anyone build a lodge here? As Mike glides through his creation he shares how he found this outpost…it was an abandoned whale research station, and occasional goose blind, which he first spotted on an aerial survey. When he finally reached the structure the overgrown foliage seemed to lift the building above the ground. All the windows and doors were knocked out by polar bears, and it stank of Arctic fox urine. But, it was propped in a place practically boiling with bears and belugas, and, freed from the limits of lower-latitude eyes, Mike knew this his destiny. There were some logistical issues. He had to freight most everything over the April sea ice from Churchill, over 60 miles away, by a 1956 D6 Cat at a blistering 2 mph. In a balmy 20 degrees below zero. Past large carnivores who see humans as juicy treats. To some the challenge seemed a bit daft….one trip the 40,000 lb. bulldozer, driven by his brother, broke through the ice. But he persisted, and with patience, ingenuity and lots of familial support, he cobbled the vision together. Fresh water had to be piped in from a lake over a mile away. In his first year of operation, 1994, he had one client. Now the season is almost completely booked. After the tour, Mike says it’s time to go for a walk. But, of course, this is no ordinary walk. There are nine others staying at the lodge, ranging from an Indian family with two pre-teen boys, an Italian countess who speaks little English; a Chinese photographer who speaks no English (the common language is biota), and a retired couple who travel the world seeking bucket list wildlife. We all suit up in thick Salus jackets and Wellington boots, and step out onto the springy tundra. The first few steps into this primal kingdom are already rewarding…we pass a huge hare, something from Wonderland after Alice has shrunk. It’s an Arctic hare, largest in the world, says Terry our tuque-topped guide. Then we have a Caddyshack moment as a scurry of little furry animals darts about, popping in and out of gopher-like holes…they are sik-siks, the Innu name for arctic ground squirrels who dash at these latitudes. And to the east squadrons of geese crank themselves across the bay. 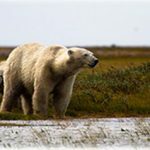 Then, after a couple hundred meters into the tidal flats, in a spot where the line between land and water looks like a charcoal sketch, we make the acquaintance….a large, lustrous white bear, tossing about on a bed of grass, yawning and scratching in a seeming state of torpor. Is this exercise harebrained, facing, without glass, steel cage or fence between, a 1500-pound killer with teeth and claws like knives who can run faster than a horse? Despite our tool use, language abilities and capacity for abstract thought, we are bowed down in the true natural order of the world here, no better than human sliders, two-legged canapés, for the dominant beasts. Terry, stormless and cool, a 12-gauge shotgun slung from his belt, explains that after the bears exit the ice in summer they go into a state of “walking hibernation,” slowing down the metabolism, eating little, waiting for the Hudson Bay to refreeze, so they again can roam the ice platform and hunt seals. It’s this slowed-down state that allows humans to get close, though it certainly speeds the blood. We are so close I can see his white fur rippling like a field under wind; and I feel the hair bristle on the back of my neck. We cast long shadows here in summer, and as the sun skips along the horizon we make our way back to the lodge. Inside, in front of a south-facing window the size of Iceland, we’re treated to the first of a pageant of gourmet dinners, all the more fantastic as everything has to be flown in by small plane. We sip fine Canadian wine (not an oxymoron any more), and dine on dancing chicken, mushroom turnovers, Mandarin orange salad, and mozzarella mashed potatoes. “Hurry. The tide waits for no man or woman,” Terry scolds next morning as I worm on my gumboots. 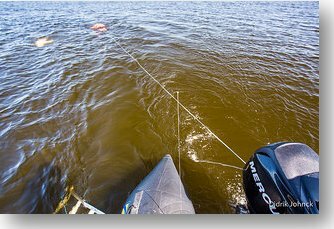 Indeed, the Hudson Bay tide is dramatic in front of the lodge, leaving several hundred yards of mud in the low, and then rolling up over the teeth of the shoreline with the high, which is when the Zodiacs can be launched. Under the lambent light of morning we motor south to the shallow mouth of the Seal River, where nutrient-rich waters host the highest concentration of belugas in the world. The scientific name for beluga is Delphinapterus leucas, “white dolphin without a wing” (meaning without a dorsal fin), and indeed the pale peel distinguishes belugas from all other whales or dolphins, and makes them look like sunken ghosts slipping about. As Terry turns off the engine the air is filled with the whoosh of surfacing whales, of water spouting blithely from spiracles, jets that catch the sun. White whales pass under our boat like gleaming underwater missiles, evoking lore oft denied, that belugas were secretly trained by the Soviet navy to attack enemy frogmen with harpoons attached to their backs, and to carry out kamikaze strikes against enemy ships. They do have the most sophisticated echolocation system of any marine mammal, and supposedly learned to distinguish between Soviet and foreign submarines by the sounds of propellers, and were taught to carry mines to the hulls of enemy vessels to blow them (and themselves) up. Hard to fathom as Terry slips a hydrophone into the water, and we are serenaded with cheery whistles, bird-like cheeps, rascally raspberries, fun house door hinges and rubber-band boings, not the sounds expected of soldiers in the sea. Mike tells that as he was raising his kids in the lodge they would often swim with the thousands of belugas off their front deck. But even though the cetaceans are famously curious, there were few close encounters. Then he noticed that the whales liked the prop noise and bubbles from the boat engine, and would follow his wake. So, he decided to tow his daughters behind. Now pods of belugas would muster, but it was difficult to see them while being pulled head-first by the boat. So, he decided to turn things around, and put the rope around the ankles, turned on the motor, and towed his daughters backwards. Now scores of smiling belugas would approach and play around the face of anyone being towed. Then, he discovered they like music, and so now the human trollers sing to the cigar-shaped whales, and they sing back. 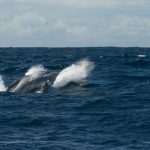 They are often called “canaries of the sea,” and are, it turns out, the most vocal whales in the world, with over 1200 sounds at their disposal. And, they love a good duet. Back at the ranch Mike shares that not only has he built a high-end safari-like lodge in the middle of one of the harshest environments on earth, but he has made it the greenest retreat in the Canadian Arctic. It is completely off the grid. “We like being remote. We like doing something a little more on the fringe, more on the edge.” He overwrote the former shack, and assembled his version with driftwood and stone from the shoreline. Solar panels provide the power; the water is heated by bottled-gas. A grey water recycling system is employed. Even the menus feature humanely harvested local fish, game, wild berries and salad greens from the highest latitude vegetable garden in Canada, just outside the door. After a lunch of caribou chili con carne with utterly addictive Nanaimo bars for dessert, I chat with Karli and Allison, two of Mike’s daughters. They were brought up here, and instead of puppies they had polar bears in the yard, and instead of TV or video games, they swam with belugas, watched the Northern Lights and chased sik-siks. The first bedroom in the lodge was the size of a laundry room (what it is today), and while Mike and Jeanne slept on one end, Karli and Allison, and their sister Rebecca and brother Adam, slept on the other, stacked like cordwood on shelves. “Several times I’ve had to wipe Polar Bear snot off the windows,” Allison divulges as one of her chores. While most children learn about other cultures and languages through books and videos, the Reimer girls just talked to the guests. The world came to them, and every week they had new visitors from all the meridians of the world who shared the lingua franca of adventure and wildlife. The Little House on the Tundra is today staffed with family members, from the chefs to the pilots to hostesses, mechanics and boat drivers. Karli has a new baby, Ezra, whom Mike brings out to show off….the next generation, already grinning with promise. The next few days are spent alternatively walking with master predators, swimming with toothed whales, eyeing avifauna (arctic terns, bald eagles, gulls, geese, godwits, gyrfalcons, grebes and such…there are over 100 species here) and stuffing faces with sumptuous meals. 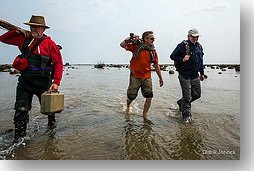 On the last day Mike offers to take us on a boat trip 15 miles further north, to check out a site on Fireweed Island off Hubbard Point where he is making a temporary camp for a group of Chinese photographers. 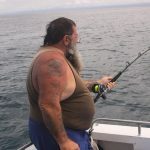 Quent Plett, a long-time Churchill Wild guide, is second mate. As we approach the site we see a polar bear sprawled like a snowplow near the water. He lifts his nose to the cool blue sky. Then behind it another big sloped head pokes out of the grass, gets up, shakes like an over-sized dog and tracks up the beach. Then a hundred yards away another appears and melts into the bushes. More and more pop up. I’m in awe, but Quent yells to Mike, “Look, there’s an eider,” and Mike turns the boat for a better look. It’s telling, perhaps, that Mike and Quent have seen so much white fur that a duck gets more attention than a sloth of bears. At one point I count 14 polar bears in my field of vision. They scatter in different directions, with several splashing into the water and swimming towards Quebec. We motor up alongside a couple of big boys deeply scarred from alpha clashes, like old boxers with wounds that never fully heal. Mike blandishes them with soft words, but they grunt and throw us black stink eyes, as if we’re pointless inconveniences, like black flies. Then they paddle onwards, living up to the name, Ursus maritimus, and I find myself resisting some magnetic force that makes me want to jump into the clear, perfect water. This is a sublime moment, inches from the jaws of the largest carnivorous land mammal on earth. This is terror mixed with awe mixed with admiration, yet it is pleasurable because I am reasonably certain that the aluminum hull of the boat we are riding will contain us from being eaten. 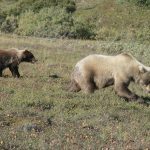 The bears turn, and scull off towards the horizon. Back at the lodge, Allison mixes designer cocktails, Seal River Slammers, a concoction of sloe gin, raspberry juice, sweet and sour mix, lemon and Blue Curacao. Combined with the caribou bacon wraps, we start to collectively hallucinate…a neighbor, wrapped in white fleece, is ambling over for hors d’oeuvres. Just another polar bear, Allison rectifies, and hands over a pair of binoculars with one hand, while pouring another cocktail with the other. Then over a dinner of caribou hip roast capped with sabayon fruit bowls with cherry almond biscotti, Mike shares he was a southern Manitoba farm boy who kept gazing north. 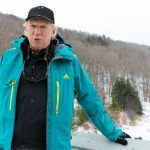 His wife’s side of the family has been involved in adventure tourism for over 40 years; in the lodging business for a century. And somehow the chemical mixture of the merged families made a magic potion that put lodges in the most severe landscapes on the planet, against the odds and pleas for sanity. Now, though, former naysayers are looking into building along the upper Hudson Bay; and the folks who run the polar bear theme park tours on tundra buggies are openly envious of the Churchill Wild walking safaris; and others are looking into offering whale swimming tours similar to what Mike and his family pioneered. But Mike’s not too concerned. He was first, and knows he will always be a step ahead of the madding crowd. History just may prove Mike Reimer the sanest of the lot. Excellent article. I enjoyed it a lot.